Scientists now think that the invention of cheese happened thousands of years before it was trendy among the Sumerians and Egyptians. Scientists now think that the invention, or possibly the accidental discovery, of cheese happened thousands of years before it was trendy among the Sumerians and Egyptians. While examining artifacts dug up in Poland, researchers came across some odd-looking broken pottery pieces riddled with holes. Noting their resemblance to today’s cheese strainers, the scientists went ahead and tested them for residue. They were quite excited to find evidence that dairy had once been in contact with them. While they cannot confirm it was actually cheese, they believe that is the most logical dairy product and given the age of the pottery, it would date cheese-making to thousands of years earlier than previously believed. They believe the making of cheese was stumbled upon about 7000 years ago. Whether it was a process they cultivated or one they accidentally came upon remains unknown. Milk becomes cheese when it’s combined with the rennet from the stomach of mammals. The cheese could have initially occurred as a result of the common dairy storage vessels of the time — dehydrated animal stomachs. Regardless, the experts feel that either way the presence of the still-loved food and the bowls used to make it mark a major turning point for Neolithic farmers, as they’re evidence of successful and specific design. 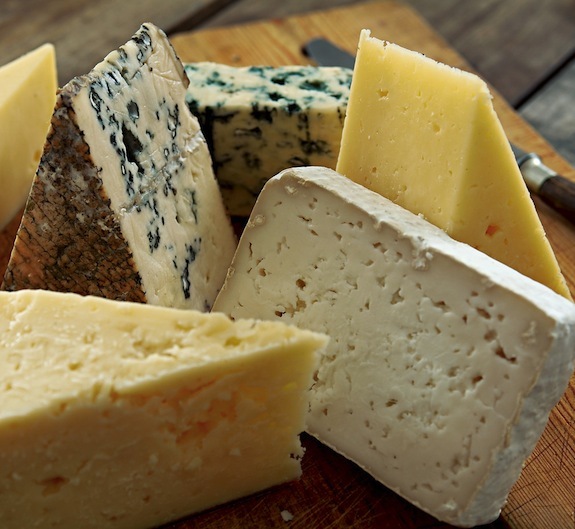 Archaeologists have long known that cheese is an ancient human invention. Wall murals in Egyptian tombs from 2000 BCE depict cheesemaking, and Sumerian tablets written in cuneiform text seem to describe cheese as well. Our distant ancestors, it seems clear, knew about the wonder that is cheese. 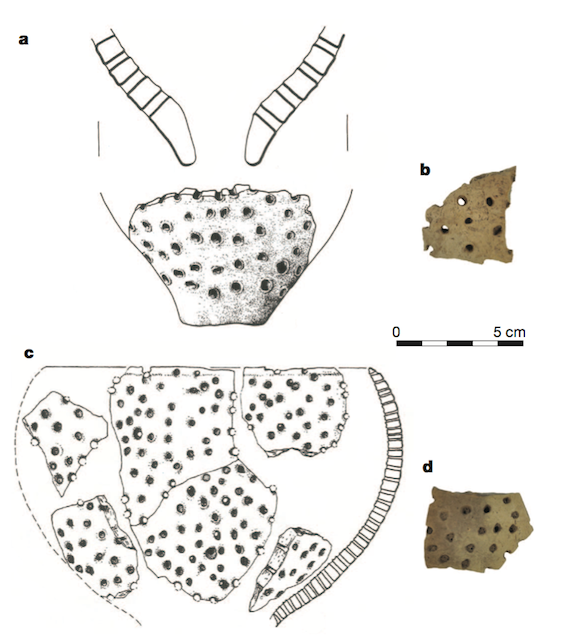 Researchers tested these perforated ceramic fragments and found ancient dairy residues, indicating they were used as cheese strainers. Image via Salque et. al. Although different cheeses are made by a variety of processes, nearly all start with the separation of milk into liquid whey and solid curds. This is typically accomplished by adding bacteria to the milk, along with rennet (a mix of enzymes produced in animal stomachs), then straining out the liquid from the newly-coagulated curds. These perforated pots, then, seem like they were used to strain out the solids. The researchers also analyzed other pottery fragments from the site. Several unperforated bowls also had traces of dairy residues, indicating they might have been used to store the curds or whey after separation. They also found remnants of fats from cow carcasses in some of the ceramics, along with beeswax in others, suggesting they were used to cook meat and sealed to store water, respectively. Apart from being capable of making a complex food product like cheese, it seems that these ancient people also created different types of specialized ceramics for different purposes. The authors of the paper believe this ancient cheesemaking goes a long way in explaining a mystery: why humans bothered to domesticate cows, goats and sheep thousands of years ago, rather than eating their wild ancestors, even though genetic evidence indicates that we hadn’t yet evolved the ability to digest lactose, and thus couldn’t drink milk. Since cheese is so much lower in lactose than milk, they say, figuring out how to make it would have provided a means for unlocking milk’s nutritional content, and gave prehistoric humans incentive to raise these animals over a long period of time, instead of slaughtering them for their meat immediately. Making cheese also gave these people the ability to preserve the nutritional content, since milk spoils much more quickly. That leaves one more pressing question—what did this ancient cheese actually taste like? Without abundant access to salt or knowledge of the refined heating and ripening processes that are necessary for the variety of cheese we have today, it’s likely that the first cheeses were pretty bland and liquidy. Like ancient Egyptian cheeses, these ones were probably comparable in texture and taste to cottage cheese, Salque and colleagues noted. This entry was posted in Archaeology, Economic, social, trade union, etc., Mammals and tagged food, history, Poland by petrel41. Bookmark the permalink. Thanks so much, Ronnie! And congratulations with your well-deserved award!